This weekend I was my sister Laura's +1/chauffeur to her friends' wedding in Co. Meath, about an hour outside of Dublin. It was quite a hooley, as they say. For the occasion the couple rented out Ballymagarvey Village, a 19th-century manor house now converted into a hotel and event venue, very posh. Despite the classic Irish setting the wedding had a very modern globalized feel: the bride is Irish and the groom is Lebanese, so there was definitely some culture clashing going on. The best example I can think of is the two mothers' attire: the bride's mother wore a very proper ensemble that wouldn't have looked out of place on the Queen, with a fancy coat and matching hat. The groom's mother wore a flowing asymmetrical mauve dress studded with rhinestones, and she accessorized with hair extensions. They both looked lovely, but you'd never have guessed they were going to the same event. But it's a wedding, and we were all there for the same reason: to wish the new couple every happiness and to drink heavily. Irish weddings do not skimp in the alcohol department, and this one was no exception. Pacing and hydration are very important! Despite some minor cultural differences, over the course of the very boozy weekend we learned that Irish bros and Lebanese bros can get happily smashed together and act like idiots in perfect harmony. World peace! 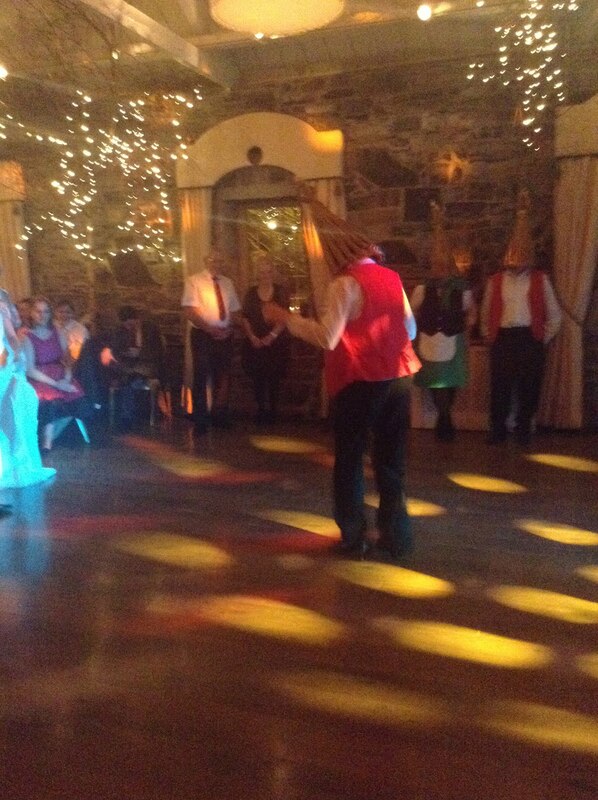 Some additional Irish flair was provided by dance performances at the reception. The first was a little Riverdance-style step dancing performance, very nice, but not unusual. The second was a group of senior citizens who performed and led the assembly in a series of folk dances while wearing weird straw cones over their faces. WHAT? These were straw boys, which the internet tells me is a wedding tradition from the northwest of Ireland, where the bride's family is from. Evidently they started out as party crashers preserving their anonymity with interesting headgear, and over time have by now morphed into entertainment troupes for hire, as strawboys' presence at a wedding is supposed to bring the couple good luck. Originally exclusively young men, the straw boys seem to have aged along with the tradition as folk dancing has fallen out of favor with today's youth. One of the dances they did with the wedding guests was called the Siege of Ennis, which is apparently at least vaguely familiar to many of the Irish guests though the foreigners had no clue. (Not the Siege of Venice, which is what I thought I heard at the time, and which I imagined would be an extremely difficult place to besiege.) You can see it performed below, though this weekend's version looked way less organized and way more fun. was it dip and dive Seige of Ennis or Rover Red Rover Siege of Ennis? I'd guess Bumper Cars Siege of Ennis, from the look of it. did the opposing line raise their arms for you to go through, or did you muscle? (or vice versa) Here in the states it seems to always be dip and dive, arch and duck, whatever... In Ireland I think it's more rover red rover, let the O'Shaughensseys come over... In any case, one of my faves too, I will be dancing it tomorrow at the local hipster Ceili! Perhaps more dip and dive than red rover, but I think there was a little of both going on as people had learned different styles.